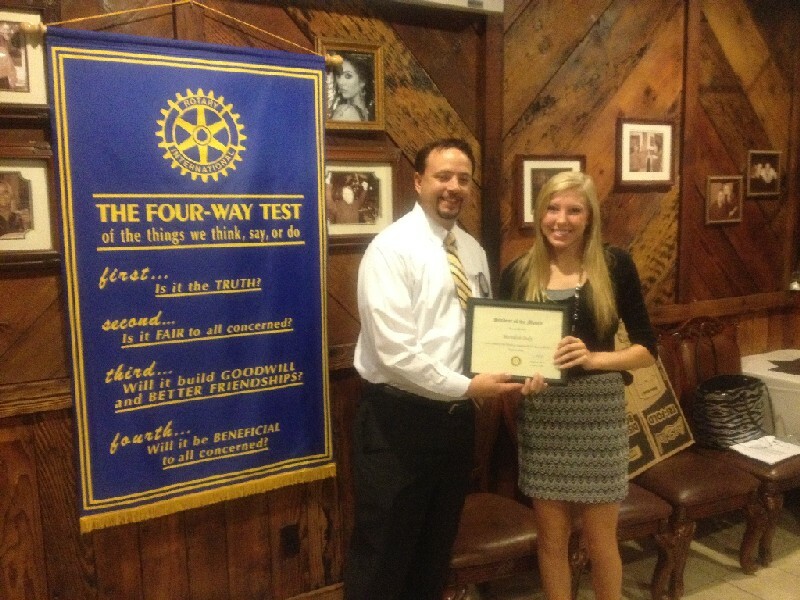 Bullard Rotary Club recognized Meredith Daly as their Student of the Month for September 2012. Meredith is a Senior at Bullard High and is currently ranked 4th in her class. Her Parents Ronnie and Dinah and younger brother Drake were also in attendance for the recognition ceremony. Among her numerous awards and achievements Meredith is the President of the National Honor Society at Bullard High, has been a member of Student Council for four years as well as a member of the Fellowship of Christian Athletes. Meredith is also involved in athletics. She is the captain of the Varsity Volleyball team and has play on the team for four years. She ran Track for one season, is a Varsity Cheerleader and played club volleyball for two years. She has a list of other awards and accolades, in addition to her class ranking, including A Honor Roll 10th and 11th grade, Academic All-District Student Athlete, and All-East Texas, Honorable Mention, Miss Armed Forces Essay Scholarship Contest Finalist and is the class of 2012 Homecoming Queen. Her hobbies include reading, volunteering and hanging out and relaxing with friends. Upon graduation, Meredith plans to attend UT-Austin and Major in Communication Sciences and Disorders in order to become a speech-language pathologist. Bullard Rotary members are proud to recognize Meredith Daly as out September 2012 Student of the Month.